A distinctive hour glass shape makes this laser engraved ballpoint promotional pen a timely choice for your next promotion. The detailed accents and rich colors will get your message noticed! Twist action promo pen with black ink. Stylish rollerball promotional pen with modern design and black ink. Elegant brass barrel promotional pen with black ink. 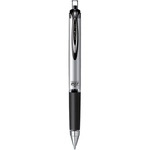 Classic promotional pen with black ballpoint ink and twist action mechanism. Elegant brass barrel custom pen in your choice from three colors with black ink. Professors and professionals will love this executive quality twist custom imprinted pen.